Can we really unlock our personal power by adopting “powerful” body postures? Unfortunately, the findings that link these so-called “power poses” beloved of certain politicians with a real sense of power and control are difficult to replicate. We may not yet understand the mechanism through which body postures influence our psychological states, but our recent study suggests that we may draw insights from the rapidly expanding research on the psychological benefits of yoga. In our study, some participants performed two simple yoga poses for two minutes, while others performed “power poses” for two minutes. Afterwards, those who held the yoga poses reported improved subjective feelings of energy, sense of power, and self-esteem compared to the other group. What could lie behind this apparent boost? One theory is that yoga’s psychological benefits may be linked to the functioning of the vagus nerve. This, the tenth cranial nerve, is the longest of the autonomic nervous system which is responsible for the body’s unconscious functioning such as breathing, circulation and digestion. But intriguingly its functioning is also directly linked to social competence and beneficial emotional regulation. Yoga is the practice of non-competitive, physical exercise involving held poses (in Sanskrit, asana) combined with regulated breathing (pranayama) and meditation techniques. The past few decades have seen a great increase in the practice of yoga in the West. Over 31m adults in the US have practised yoga at some point in their lives. Multiple studies point to the positive effects of yoga on mental and physical health, as well as on personal development. Yoga alleviates chronic pain. It helps manage coronary artery disease, asthma, diabetes, lymphoma, and breast cancer. Yoga helps individuals suffering from mental health problems, such as depression, anxiety, obsessive-compulsive disorder, post traumatic stress disorder, and schizophrenia. Regular yoga practice also benefits healthy individuals, improving psychological well-being, satisfaction with life, and self-esteem, and reducing stress and performance anxiety. Studies have also found that yoga reduces fatigue and negative affect, while increasing positive affect and giving a feeling of being energised. Our study was unusual compared to others examining the effects of yoga practice in that it examined only the asana aspect of yoga in order to investigate its effect on self-esteem. Predominantly, research into yoga has focused on the benefits of meditation and breathing. A recent review of 465 research papers devoted to yoga’s role in promoting well-being noted that only 169 of those papers included the physical aspects of asana. To the best of our knowledge, only two previous studies have focused solely on studying the psychological effects of yoga poses. We compared the effect of the tadasana, urdhva hastasana and garudasana yoga poses to two “high power” and two “low power” power poses. We found that after performing two yoga poses our participants felt more energetic, empowered, and in control than those participants who performed power poses. Feeling energetic directly affected their confidence and feeling of satisfaction with themselves regardless of their initial levels of self-esteem. We think such effects had less to do with the meaning of dominance associated with the poses, and more with the feedback that the body alignment in yoga poses provides to the parasympathetic nervous system – the part responsible for regulating the body’s unconscious actions. The high power poses were seen as more dominant and confident than yoga poses, but were less effective in increasing participants’ self-esteem. So if it wasn’t the non-verbal meaning conveyed by the body postures that affected our participants’ self-perception, what was it? We can’t answer this directly, but its effect can be interpreted in light of the existing literature. How do yoga poses affect the body? The dispersed effects of yoga practice can all be linked to a common mechanism: the functioning of the vagus nerve which connects the brain (and therefore the mind) to the body. 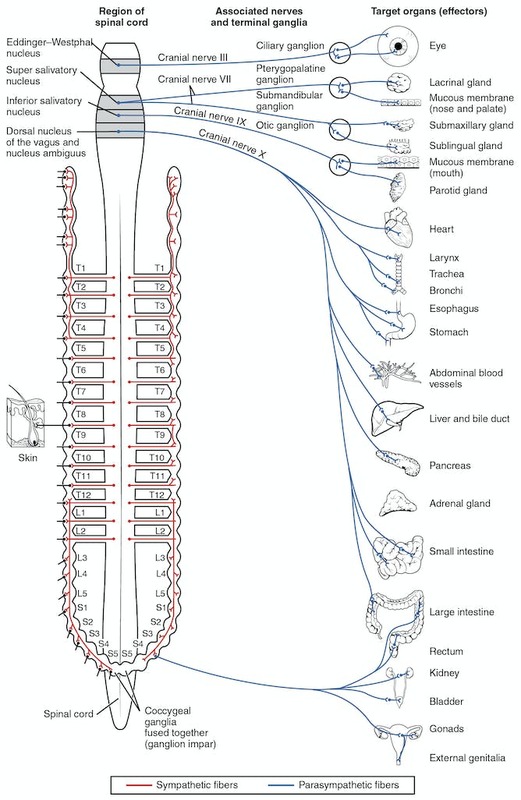 From the brain stem, the vagus nerve connects facial muscles, heart, lungs, digestive tract, kidneys and reproductive organs. It plays a key role in operating the parasympathetic nervous system which includes the feed-and-breed and rest-and-digest processes, and also regulates heart rate, and promotes calm and soothing states. The nerve is responsible for the neural regulation of parts of the body necessary for communication: the larynx, the eyes, the inner ears (particularly helping to distinguish human voices from background noises), and facial muscles involved in vocal and non-vocal expressions. It also regulates our caring behaviour, hence why a well-functioning vagus nerve leads us to feel calm, relaxed and safe in relation to others. This is also reciprocal: feeling calm, relaxed and sociable also stimulates the vagus nerve. This means it’s possible to start off a positive upward spiral of well-being either by affecting the states of the body or the states of the mind. 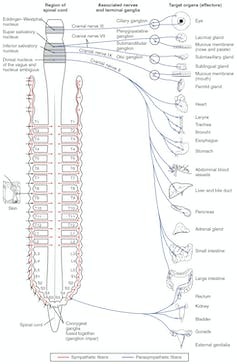 Research suggests that the proper functioning of the vagus nerve (assessed as the “cardiac vagal tone” indicating the degree of the vagus nerve’s influence on the heart) promotes emotion regulation, social competence, and prosocial behaviour, and dampens aggression, hostility, depression and anxiety. This supports our theory that yoga practice – meditation, breathing, and performing yoga postures – tones the vagal nerve. Our findings suggest that even a short practice of yoga poses may positively affect the vagal tone, making us feel more satisfied and happy.